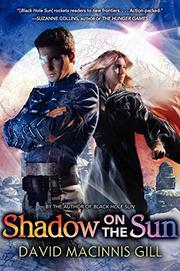 In this fast-paced sequel (Invisible Sun, 2012, etc. ), ex-Regulators Durango and Vienne are at it again in a race against time on a dangerous Martian landscape. Shocked to have learned that his father heads up the enemy forces who captured him at the end of the previous book, wisecracking teen soldier Durango fights to escape the clutches of his evil dad and to reunite with his ex-assassin sidekick and love interest, Vienne. Meanwhile, Vienne seeks seclusion in a hidden monastery until she’s offered a gig transporting fugitives through enemy territory with a team of thuggish hoodlums. Gill’s work flips back and forth between the two adventures, punctuated by odd breaks of gibberish that at first read like unintelligible computer coding. Readers will eventually deduce that the code is actually connected to Durango’s artificial intelligence, Mimi, whose presence is so strong in this book she’s almost a secondary character. The rest of the narrative flows easily, and the action races along with plenty of last-minute saves, narrow escapes, fiery explosions and smart-alecky one-liners. This sequel doesn’t stand alone, and Gill inserts just enough left turns and red herrings to keep seasoned series readers guessing. Still, it’s inevitable that someone as daring and brazen as Durango will always come out on top in the end—the fun’s in the watching.